Although we seldom celebrate Thanksgiving down under here, I love having any pumpkin savoury or sweet dishes now and then throughout the year. 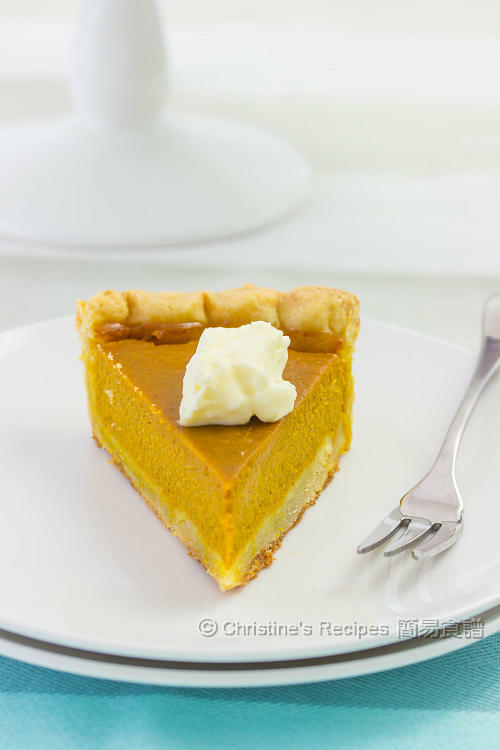 This old fashioned pumpkin pie is one of my most favourites. Its sweet, creamy and spiced pumpkin filling makes me feel like more and more. I like more flaky crust to go with the filling. My version has a higher crust edge. 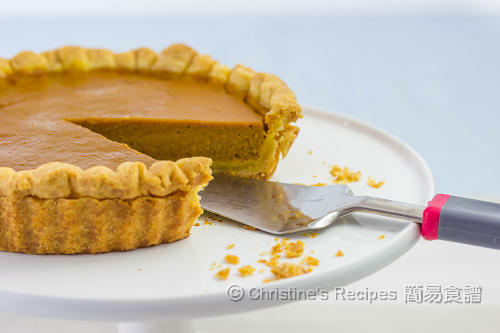 As I made the pumpkin puree from scratch, it took me some time to make the whole pie. Yet it’s worth every effort after all. It’s completely delicious. To make a perfect flaky crust, it’s important to use two key ingredients, cold butter and chilled water. Apart from that, it’s quite easy. Hope you’ll enjoy it. Cut cold butter into cubes. Chill in fridge for later use. In a food processor, pulse flour, salt and sugar. Add in the cold butter cubes. Pulse 8 to 10 times until the mixture forms pea-size pieces. Gradually add the chilled water, 1 tablespoon at a time and pulse a few times between additions. The mixture should be moist, but not wet. Transfer to a lightly floured surface. Gather the dough into a ball. Press with the heel of your palm to smear the dough for a few times quickly. Roll it into a disc. Wrap with a plastic wrap. Chill in fridge for 1 hour. Deseed, peel and cut the pumpkin into cubes. Use a microwave oven or wok to cook until softened. If steamed, remember to cover to prevent from water dripping on the pumpkin. Place pumpkin in a sift for 10 minutes and drain well. Use a food processor to process into a paste. 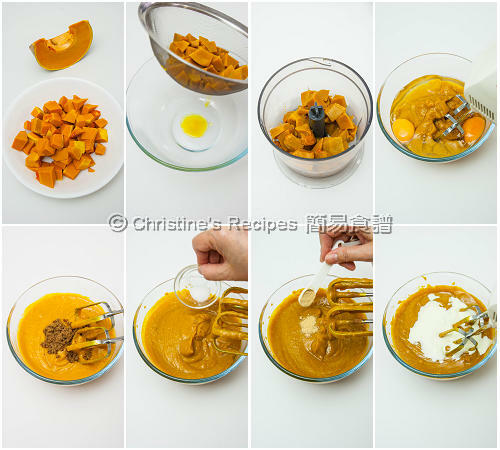 Transfer the pumpkin puree into a large mixing bowl. Mix in the egg, yolk, brown sugar, white sugar, salt, cinnamon, ground ginger and vanilla extract. Combine well. Stir in the whipping cream. Set aside. Preheat oven to 180C/ 350F. Remove the chilled crust from fridge. Let it sit for 5 to 10 minutes. Cut out 1/3 of the dough and chill for making edges later. With a rolling pin, roll out the 2/3 of the dough into a 10-inch circle. Transfer to an 8-inch pie pan. Prick the base with a fork. Line with baking paper and place ceramic beads or beans on top. Transfer to the preheated oven for blind-baking, about 10 minutes. 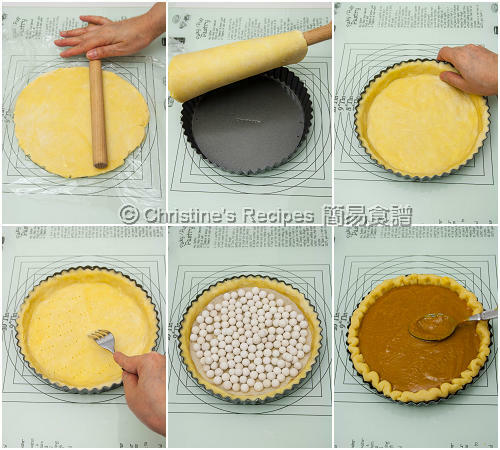 Remove the beads and baking paper. Continue to bake for another 10 minutes. Let it cool on a wire rack. Remove the 1/3 chilled dough from fridge. Roll it into a 1 to 1½ -inch long strip. Crimp it on the edges of the crust. Pour the pumpkin mixture into the pie shell. Bake for 30 to 40 minutes, or until an inserted needle comes out clean. Transfer the pie on a wire rack and let it cool down. Serve warm with whipped cream. 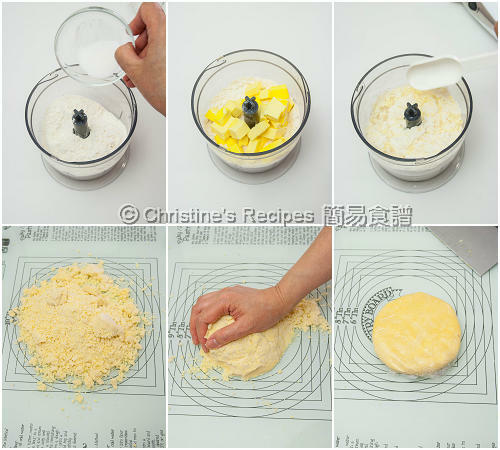 To make the best and perfect crust, we have to use cold butter and a food processor to blend it with the flour. If not using a food processor, you can rub butter and flour together with your finger tips and thumbs. Move quickly and try to keep the butter cool after mixing. The mixture should look like breadcrumbs. If you spot some small lump-like butter in the mixture, it’s fine. Please note that the water content of each type of pumpkin is slightly different. Personally, I like to pick the type with sweet pulp. I used the Kent pumpkin here. Hi Christine. I saw your post of Teochew Dumplings in your Chinese blog. I have been looking for this recipe for a long time and was glad to see it but it would be great if you could post it here too in English for the Chinese-illiterates like me. Thanking you in advance. I've put it in my to-do-list and schedule to post the English version here when I finish translating. Thanks for your patience. Btw, have you subscribed my blog? If so, you won't miss it once I post the recipe. 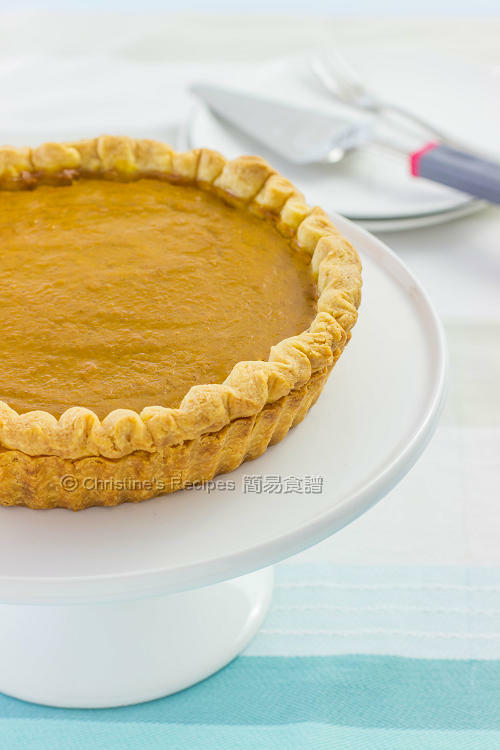 It has been ages since I last baked or had a pumpkin pie. This looks awesome, Christine.